Shannon Blues Junior B captain, Simin Sinnott, presented with the cup. A young Shannon Blues team captured the junior B championship in convincing style on Saturday evening. Donegal battled to stay in the game, but a last minute goal came a little too late to provide any realistic hope of pulling off a comeback. The Blues proved to be that bit fitter and stronger and remain unbeaten at this level for the season. .
A highly competitive first half saw the Blues take the break four points to the good. Steady free taking from James Young and a Conor Fitzgerald goal half way through the period had the Blues on top. Donegal tallied a fine goal from Chris Rush after some great work by Jason McDaid and Matt Cutliffe, but the Blues had that little bit more going forward and finished the half with points from Tommy Hernon Young. At the break it was a 1-7 to 1-3 Blues lead. Matthew Cutliffe on the attack for Donegal. The Blues extended the lead to seven points following the restart. Donegal endeavored to eat into the deficit, but attacks from the northerners frequently met their end within 30 yards of goal. Barney Friel entered the fray and brought some tenacity to Donegal’s efforts, but even when a shot got off the ball ended wide of the mark. The Blues always looked dangerous when on the attack, Cian Moriarty pointed late in the game. The Blues sat on the lead as the light began to fade, and Donegal searched for a way a route to goal through the defence, but met with dead ends until Chris Rush forced a shot over the line from close range. Unfortunately for Donegal time was up seconds later and the Blues deservedly earned the title and a crack at the North American next weekend. Blues: Gary Henry, Mike Moriarty, Mike Keegan, Pat Moriarty, Simon Sinnott, Damien Sweeney, Maurice Young, Pat Murray, Cian Moriarty, Brendan Driscoll, Conor Fitzgerald, James Feeney, Tommy Hernon. Donegal: Chris McLaughlin, Phil McCaffrey, Michael McBride, John Deery, Hugh Devine, Luke Reden, Mark Dunphy, Ciaran McDevitt, Jason McDaid, John Duggan, Ronan Shovlin, Matthew Cutliffe, Chris Rush. Shannon Blues captured their second senior football championship in three years in a nail biting encounter with first time finalists, Wolfe Tones. A large crowd enjoyed a superb final that could have gone either way until the final few minutes. It was all square with ten minutes left, and Blues finished with four points on the trot to end up on the winning side. It was an up and down battle in the first half with each side making forays into opposition territory with each kickout. Marty Farrell and Sean O’Connor traded three points each to get things going, O’Connor’s left boot was working well as was Farrell’s accuracy from the frees. The Tones then went on a run of four unanswered points. Darragh McVeety put two tremendous efforts over the bar, and Michael Argue another. In the meantime Charles McCarthy had to make way due to an injured leg, and on came Dan McCabe. The Blues started to threaten and worked an opening for Darragh Treacy who put the shot from the edge of the penalty area wide of the far post. Sean Moriarty was then in for another goal chance but his shot was a little high and went over for a point. Farrell put another great score over for the Tones, before O’Connor answered in kind with a fine point, this time off the right boot. Darragh Walsh added another fine score for the Blues. It was helter skelter up and down the field at this point and Cathal Hynes pulled off a fine save to deny the Blues a goal and preserve the Tones lead. At the break it was an eight points to six Tones lead. Before the second half was three minutes old the Blues had turned the deficit into a three point lead. Two quick points from Treacy and Moriarty had the teams all square before Treacy finished a strong run with an uncompromising shot that billowed the net. The Tones were not discouraged and their running game paid dividends as they ran at the Blues defence. Frees were conceded by the Blues and Farrell took advantage on two occasions. A Killian Clarke pointed a 45, along with a McCabe point had the Tones level, a Sean O’Connor point came in between for the Blues. As the game entered the final stretch Hynes pulled off two fantastic saves to keep the Tones in it with the Blues ahead by a point. O’Connor had put the Blues ahead with another excellently taken point before James Walsh had only Hynes between him and a goal. The second chance fell to Darren Wallace as the Tones were hanging on to keep the game from getting away from them. Hynes dived to his left and put the ball out for a 45 that was put over the bar by Niall Murphy. With two points in it and the game still in reach Michael Brosnan and O’Connor each pointed to put two scores in it with time expired. A great win for the Blues who will be looking to bring a North American Final to Boston next weekend once the celebrations die down sometime during the week! Blues: Conor Wallace, Trevor Wallace, Gareth Ryan, David Clifford, James Walsh, Denis McElligott, Ambrose O’Donovan. Kieran Byrnes, Sean Moriarty, Sean O’Connor, Darragh Treacy, Paul O’Connor, Niall Murphy. Subs: Darren Wallace, Shane Kavanagh. Tones: Cathal Hynes, Killian Clarke, Luke Flynn, Kevin Gorham, Kian Cleere, Mike O’Brien, Gary Brilly, Michael Argue, Darragh McVeety, Glenn O’Connell, Lee Carr, Marty Farrell, Charles McCarthy. Subs: Sean McGuire, Dan McCabe, Cormac Joyce-Power, Darren McGuire. Tom's celebrate their first Boston championship victory in 10 years. Fr. Tom Burke’s bridged a 10 year gap and captured the senior hurling championship for the first time since 2004. A brilliant second half performance from substitute John Mulhall turned the tables in favour of Tom’s, and two goals in the latter period by Ian McDonnell earned Tom’s a well deserved victory over arch rivals Galway. The first half was marked by several wides early on from Tom’s and later in the half from Galway. In the meantime Galway tallied six points, Rory Hickey, John Moylan, and Paul Holden contributed to the tally. A Galway penalty resulted in a point after Alan Keating deflected James Skehill’s shot over the bar. Tom’s found the going tough around the half forward line. Galway’s first line of defence was solid and much of the ball dropping in that area was returned from whence it came. A goal kept Tom’s in the game. Joe Fitzpatrick crossed the ball to Ian McDonnell who batted home from the far post for Tom’s first score of the game. Fran Keenan pointed once from a free and once from a sideline cut to keep it close. At the break Galway led by a score of 0-7 to 1-5. Tom’s stormed out of the gates following the restart and the fortunes of the forward line greatly improved. Kilkenny man John Mulhall had been introduced just before half time and with his presence on the field, Tom’s game had some added bite to it. After a three points to two start to the second half, Ian McDonnell’s persistence resulted in a goal. The chance came from a Shane Howley hook further out the field broke up the Galway’s possession, and the ball ended in McDonnell’s hand. The big man’s strength made the opening for the shot. Galway’s John Moylan got the goal back minutes later. A clean grab from a puckout and Moylan was off to the races and finished well into the corner of the net. The goal reduced Tom’s lead to two points as Keenan had hit three frees. Tom’s further extended their lead with points from Keenan, McDonnell, and Mulhall and the belief grew among the Tom’s supporters in the crowd that the day could be theirs. On the field Tom’s dug deep and every ball was tightly contested as they could taste the win. Galway needed a goal as time was running out, but it was McDonnell who netted for Tom’s and rounded off his hat trick with 2 minutes to go, the goal another where strength and persistence paid off to put the ball over the line. There was too much for Galway to do at that stage and Tom’s celebrated a well earned victory. Tom’s last Boston championship was also marked with a NACB championship. Seamus Higgins, who started on Sunday, was also on that Tom’s team that dominated in Denver in 2004. San Francisco’s Na Fianna will be coming to town looking to make it four North Americans in a row, Tom’s will have their work cut out. Tom’s: Alan Keating, Gordon Joyce, Cahir Healy, Dylan Costello, Cormac Joyce-Power, Niall O’Brien, Seamus Higgins, David O’Mahoney, Ian McDonnell, Zane Keenan, Shane Howley, Joe Fitzpatrick, Oisin Burke. Galway: James Skehill, Paddy Dowling, Chris Murphy, Sean Phelan, Greg Lally, JJ Doyle, Odhran Floyd, James Regan, Paul Holden, Rory Hickey, John Moylan, Thomas O’Hanrahan, Richie Cummins. Tir na nOg and Connacht Ladies played a tremendous senior final. Unbeaten this year, Tir na nOg were pushed all the way by the defending champions, who looked out of contention a few short weeks ago. Each side dug deep when the chips were down in the second half, and it was late second half goal by Roisin Leonard that proved to be the difference between the teams in the end. Two Shauna Jackson goals in the opening period had Tir na nOg ahead of Connacht Ladies. Playing at corner forward Jackson stole behind the defence on two occasions to finish well. The first came mid-way through the half, and the second just after back to back points for the reigning champions drew them within two points. Jenny Byrne punished fouls by the Connacht back line with five points from frees. Connacht were a match for their unbeaten opponents and played their best football of the season. Catriona Smith at wing forward was especially effective, and Jane Ward showed some of the form of the past two years to keep their side in the game. Catriona Foley at full forward showed well for the ball and when in possession looked dangerous. Foley answered Jackson’s second goal with a well taken effort right from the kickout and at the break it was a two point lead for the challengers. The second half saw each side fight for every ball and inch of space in an effort to gain the upper hand. With fifteen minutes to go it was all square. A Byrne free had put three points between the teams, but Connacht answered with three in a row. The leveling score came from Joanne Conroy who was also found to be helping her defence soon afterwards. Each set of defenders made enormous efforts to deny the opposing forward lines room to move the ball, full back Ellen Healy came out with the ball on a number of occasions for the Brighton side, and Connacht Ladies Siobhan Polly denied Tir na nOg scoring chances several times. Tir na nOg goalkeeper Niamh Hynes made two brilliant saves to prevent the defending champions from netting what would be a go ahead goal early in the second period. A breakthrough came for Tir na nOg when substitute Roisin Leonard came up with a goal. Leonard looked dangerous at times, and a high ball found her behind the defenders and the corner forward finished well. Byrne followed with a pointed free and there was five points between the teams with five minutes to go. Connacht attacked in force as the clock ticked towards the final whistle. Aisling Kerr had a half chance that she got under and put over the bar and Tir na nOg held on to win their first senior championship since 2011. That year the Brighton side fell to Mairead Farrell’s of Philly after a brave comeback in the final that fell just short. Best of luck next weekend at the finals in Canton! Tir na nOg: Niamh Hynes, Niamh O’Neill, Ellen Healy, Amy Potts, Niamh Daly, Alison Taylor, Louise Bergin, Jane Moore, Ciara O’Connor, Lisa Leonard, Tessa Mullen, Sinead Bannon, Lisa Brick, Jenny Byrne, Shauna Byrne. Connacht Ladies: Caroline Heraty, Kelly Cunningham, Aisling Egan, Hazel Poff, Sinead Greene, Siobhan Polly, Emma Mulgrew, Claire McDonald, Joanne Conroy, Catriona Smith, Caoimhe Moran, Aisling Kerr, Jane Ward, Catriona Foley, Nora Morgan. Donegal retake the junior A championship. Donegal captured the Pat Callaghan Cup for the second time in three years with a comprehensive victory over a battling Cork side. After a tight first half Donegal took control in the second and gradually opened up some distance between the teams. With the half back line in control and a fine performance from Luke Peden after entering the game, Donegal had platform for a victory with plenty of room to spare in the end. It was an evenly contested opening period. Cork got off to a three point start, the first from Mick Lyons followed by two from Mike Moynihan. Donegal opened their account nine minutes in with a Christy McLaughlin point. Pauric McLaughlin and Dean Kelly points brought Donegal level. There were great saves at either end as Mike Moynihan came close for Cork only to be stopped by Jonathan Byrne, and Christy McLaughlin had a close range shot well saved by Kieran Reid. The teams traded points for the remainder of the half, Darren Green stole forward from center back to put one over the bar for Donegal and give his side a lift. Christy McLaughlin put the odd one over the bar to provide Donegal with a slight edge going into the break. with the Pat Callaghan Cup. Donegal asserted themselves on the game in the second period and limited Cork to a solitary point for the entire 30 minutes. With Cork having a difficult time moving the ball into scoring positions, or winning much of the breaking ball around the middle of the field, Donegal opened up a five point lead. Peden had entered the game at wing forward for Donegal and made an immediate impact. Peden’s speed when in possession was a tremendous asset. Reid was required to make another save from McLaughlin to deny Donegal a goal, but the points could not be stopped by the Cork keeper. Grant, Kelly, and McLaughlin put five over the bar between them before John Crowley got Cork back on track with a point fifteen minutes into the half. With ten minutes to go Donegal held a solid looking six point lead. Dean Kelly had moved to the middle of the field and took over marking duties of Niall O’Connor who had looked as though he might be starting to bring Cork back into the game – although by that stage a goal ot even two would be required to bring the rebels back into contention. Cork’s chances were well and truly extinguished after Thomas Caldwell put seven between the teams before Owen Grant was pulled down in the box and Donegal won a penalty. McLaughlin took it well and hit the bottom right corner. Donegal looking impressive entering the North American Finals next weekend and will be hoping to return the junior A cup to Boston following Wolfe Tones victory in Cleveland last season. Cork: Kieran Reid, Eoin Barry, Mike Carolan, Colm Caffrey, Dan O’Regan, Darren O’Donovan, Niall O’Connor, Mick Lyons, Shea Leonard, Mike Moynihan, John Crowley, Lar Barden, Cian Clifford. Subs: Mike Maye, Downey Brogan. Donegal: Jonathan Byrne, Sean Doherty, Declan McBride, Darren Doherty, Darren Green, Hugh Devine, Thomas Caldwell, Mark Dunphy, Ciaran McDevitt, Owen Grant, Pauric McLaughlin, Dean Kelly, Christopher McLaughlin. Subs: Brian Kelly, Luke Peden, Paddy Wanish. It was excitement all the way in the junior A hurling final with Tom’s twice coming from behind to level the scores. Tom’s forced extra time after Chris O’Donoghue netted in the final minute of normal time for Tom’s to tie the game. Wexford came through the extra period after Tom’s had fallen behind and leveled the scores a second time with a Fran Keenan goal. Wexford’s Colm Kerins netted from close range with minutes left to finally finish Tom’s off, Wexford win three out of four junior titles for the Slaneysiders. It was all square at the break. Tom’s got off to the faster start with Fran Keenan hitting the mark from distance on four occasions. Colm Kerins accounted for the lone Wexford score over the first quarter of the game. With James McDonnell in the middle of the field and Seanie O’Brien at center back playing well, things were going Tom’s way. Ciaran Moore almost netted mid way through the half, but the ball skidded wide of the far post. Wexford, however, came to terms with the game and towards the end of the half tied things up. Dave Power contributed 2 frees and Colm Kerins a fine score from a tight angle to make it five each when the half time whistle sounded. The second half was as tight as the first. Each side made some changes to try and gain an edge. John Cuddy came in for Tom’s, while Wexford introduced Tommy Walsh to great effect. After matching each other for three points a piece, Tom’s netted. Chris O’Donoghue found Ciaran Moore who sidestepped the keeper and finished into the empty net. Keenan followed up with a free and Tom’s led by four. Wexford answered with six in a row to take a three point lead with ten minutes left. Walsh, who was very effective, and Paddy Breen each pointed, as did John Joe O’Neill, Kerins and three from Power. With three pointes between the sides, Tom’s forced extra time with a fantastic goal from O’Donoghue. Keenan blocked a clearance to win the ball and his cross found the wing forward who fired home from the corner of the penalty box. Wexford had one chance to win it with a Power free from outside the 45, but the ball drifted wide and extra time was required. Wexford established a three point lead in the first period of extra time. Two well taken Tommy Walsh points and one from Colm Kerins had the Slaneysiders a goal to the good heading into the second ten minute period. After Walsh had put Wexford four to the good, Keenan leveled the scores with a goal and a pointed free to bring Tom’s back on level terms with four minutes left. Wexford pulled it out in the final minutes with a Breen point followed by a Kerins goal. A Greg Lundy clearance was picked up by the corner forward who fired home from close range. Two in a row for Wexford who will be looking to add a second NACB title to the list of honors next weekend. On a final note, best wishes to Peter Nolan and Caroline Hanley on their return to Ireland after many years of service to the GAA in Boston. Tom’s: Dermot Fox, Larry Guinan, Terry Doran, Chris Horan, Seanie O’Brien, Liam Keane, Barry Smith, James McDonnell, Gary Kelly, Eanna Burke, Chris O’Donoghue, Fran Keenan, Ciaran Moore. Wexford: Martin O’Connor, Peter Nolan, Denis Brennan, JJ O’Neill, Dominic Magill, Brian Dalton, Greg Lundy, Patrick Breen, iall Moloney, Gary McGovern, Gearoid O’Connor, Colm Kerins, David Power. 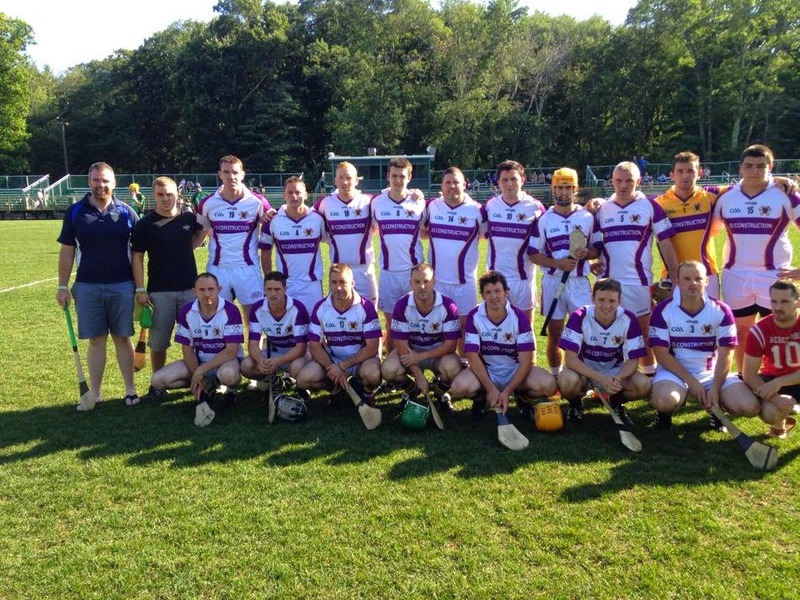 The Worcester and Barley House Wolves teams and supporters traveled from central Massachusetts and Concord NH respectively to contest the junior C hurling final at the Irish Cultural Center. It was an intensely contested, hard hitting affair with Worcester coming out on top. Three first half goals and some great defensive work carried the day for the Worcester men to win back to back championships. BHW 's Sean Naughton strikes the ball. Playing with the benefit of a fairly stiff breeze, Worcester went in at the break five points to the good on the back of three goals. Two came from the dangerous Liam Kelly at corner forward, the third from Kyle Connor just after the New Hampshire men had tied the game. Dan Swetland’s free taking was assured for Worcester, the center back tallied three points from the dead ball. Sean Naughton was also on the mark for the New Hampshire men with points from play and frees. After Jay Abramowicz had netted for the Granite State side with a goal, Will Mullen tallied a fantastic point to level matters. Connor’s goal came minutes afterwards, a sequence that left two Worcester men prone and needing treatment following the intensity of the challenges leading to the score. Worcester kept up the intensity level in the second half, blocking at every opportunity and allowing little room to their opponents. There were no easy opportunities for the Wolves. The scores did not come so easy at the other end either. Swetland and Kelly each tallied points and Worcester tallied a decent number of wides. The Barley House Wolves worked hard to try and put a dent in the two goal difference and had a number of chances that went awry. Two Sean Naughton frees were the fruits of their second half labors. The Concord men went after a momentum changing goal with decent time still left to play, but it was not to be as Worcester establish themselves as the divisional champions for the second time running. Now it is on to the finals and on home turf where Worcester be hoping to improve on last year’s outing in Cleveland. Towards the end of the game there was a lengthy delay after, Dan Hanna, of the Barley House Wolves suffered a serious neck injury. Wishing Dan a full and speedy recovery. Worcester: Aidan O’Shea, Luke Lagorsse, Matt Dufresna, John Donoghue, Dan Swetland, Ian Geraghty, Sean Shaughnessy, Cian Clifford, Timmy Jackson, Tom Lind, Kyle Connor, Liam Kelly, Mike O’Connor. BHW: Denis Trainor, Alec Foley, Michael Gregoire, Matt Palomeno, Dan Pawloski, Dan Hanna, Sean Naughton, Ryan Nickerson, Dean Williams, Will Mullen, Jay Abramowicz, Ruairi O’Mahoney, Darragh Madden. Eight games involving twelve of the clubs in the Boston Northeast division will be played this coming weekend at the Irish Cultural Center in Canton. Saturday kicks off with what promises to be a keenly contested junior C hurling final between Barley House Wolves and Worcester. The junior A hurlers of Wexford and Fr. Tom’s follow, with Wexford looking to make it three junior championships in a row. Football caps off the day with reigning junior B champions, Donegal, defending their title against the Shannon Blues. The ladies juniors of Tir na nOg and Boston Shamrocks battle for the Boston championship and the right to represent the division at the following North American Finals at the ICC. Sunday sees four finals on the card. Wolfe Tones Gaelic Football Club will experience its first senior football final day on what will be the biggest day for the club since its founding. Junior and Intermediate championships have been won and celebrated in the past, but until now the senior crown has eluded the South Boston outfit. The Tones have done it the hard way to get here, beating last year’s champions, Connemara Gaels, and arch rivals, Aidan McAnespies. Last week’s comeback victory from nine points down was so not what we are used to seeing from the Tones that the word “destiny” might spring in the minds of many. The loss of key defender, Sean Higgins, will hurt the Tones chances for sure and players will have to step up as Dan McCabe did last week after coming on for the black carded Michael Argue. A pacy forward line is the hallmark of the team, Lee Carr, Darragh McVeety and Glenn O’Connell can open up the spaces in the opposition defence. Some experienced heads on the field will be an asset for the Tones before and during the game to try and keep the minds focused on the task ahead to capture a first Boston championship. Shannon Blues have had plenty of success in recent years and with the North American Finals on home turf in Canton, this year represents a great chance for their first North American Championship at senior level. The Blues have been to the national final three times, and not come away with the title. This team is powerful all the way from the full back line to full forward. The Blues came through in the semi-final against an extremely good Donegal team that were favourites in the minds of many. The side has a distinct Kerry flavor, no less than seven Kerrymen made up the first team in the semi-final, some of whom could be playing on a bigger stage in years to come. One player who has stood out for the Blues this year is James Walsh, an efficient operator who rarely wastes the football. Sean “Coco” O’Connor is another of the Blues key men who when on the ball is a reassuring sight to managers and supporters alike. Others to watch for the Blues are Gareth Ryan, Sean Moriarty, and Niall Murphy. As for calling a winner, take your pick. The experience of the Blues, many of whom on the line and on the field have been here before, will stand to them. For their part the Tones have shown that they can last the pace this year and have taken the key scores in the last two games, but they cannot let the occasion get to them to be successful. Instinct tells me the Blues, but the Tones have proven my instinct wrong in both playoff games this season. This is one to look forward to as two great Boston rivals meet in a bid to capture the Boston title and try to win a North American on home turf. Not only that, this year is a chance for whichever side comes through to deny Na Fianna of San Francisco four national titles in a row. Galway contest their fifth consecutive Boston final, while for Tom’s it is the first since 2005. Galway last won the Boston title two years ago, and will probably go into this game as slight favourites. The tribesmen got off to the slow start this year, but came good in the latter half to finish second in the standings. Where else would you start with this team but with James Skehill. A puckout that lands inside the opposing 21 and a great shot stopper are the hallmarks of the Galway goalkeeper. Greg Lally at center back is another key player on this team, as are James Regan in the middle of the field, Rory Hickey at center forward, and John Moylan. Given an inch of room from the middle of the field forward Galway can tally the scores quickly. Tom’s have not played in anger for three weeks having finished top of the table and earning the bye to the final. With an additional weeks of rest compared to Galway, it could be a factor a factor early in the game. Like Galway, Tom’s have a reliable man between the posts in Alan Keating. The Tom’s side contains some keen competitors in Cahir Healy, Seamus Higgins, and Shane Howley. The jewel in the team is Laoisman, Zane Keenan. Keenan’s skill with the dead ball, be it a free or sideline, is second to none. Cormac Joyce-Power is another key man. The Limerick native is having a great season at center back for Tom’s. Tom’s will have their work cut out for them on Sunday and will need all their players on their game to beat Galway. Connacht Ladies contest their third senior final in a row, three for three since the club was founded. Unlike the past two years, they enter the game as underdogs. After a slow start to the year, and looking very much like a third place finish, the westerners made a late rally to earn a playoff game against Boston Shamrocks. A ten point win sees them to another final and who is to say that it could not be three in a row. With Jane Ward, Catriona Foley, and Sinead Greene manning the forward line scoring should not be an issue. The full back line will be under pressure from Tir na nOg and if that pressure can be weathered, the westerners have a chance. Tir na nOg have had a long layoff, but it is hard to see that affecting them such has been the level of their performances this year. This team is solid all the way through and the results have borne that out. One more win will mean a return to the top of the pile, and a crack at the North American title. Last time out the Boston side lost out to Mairead Farrell’s of Philly in San Francisco after mounting a late comeback. Full forward Jenny Byrne is complimented by Shaune Jackson, Caroline Nee, and Tessa Mullen in a powerful forward line. The half back line poses a difficult barrier to penetrate, Alison Taylor, Niamh Daly, and Louise Bergin have done well all season. It will be a surprise if Tir na nOg do not run the table and win out on Sunday, however, games are played for a reason as we have seen so often in the past. Donegal are looking to add another junior A title to the one last captured in 2012. The northerners have a strong team to accomplish the task. Jonathan Byrne is a reliable performer between the sticks, and the half back line is as strong as you will see at this level in Boston. Hugh Devine will be keyed up for the game and lead from the back. Once he gets going, Christy McLaughlin at corner forward will have to be watched, while Pauric McLaughlin covers a mountain of ground from wing forward. With American born youngsters Mark Dunphy and Ciaran McDevitt in the side, Donegal will be the toughest hurdle for Cork. 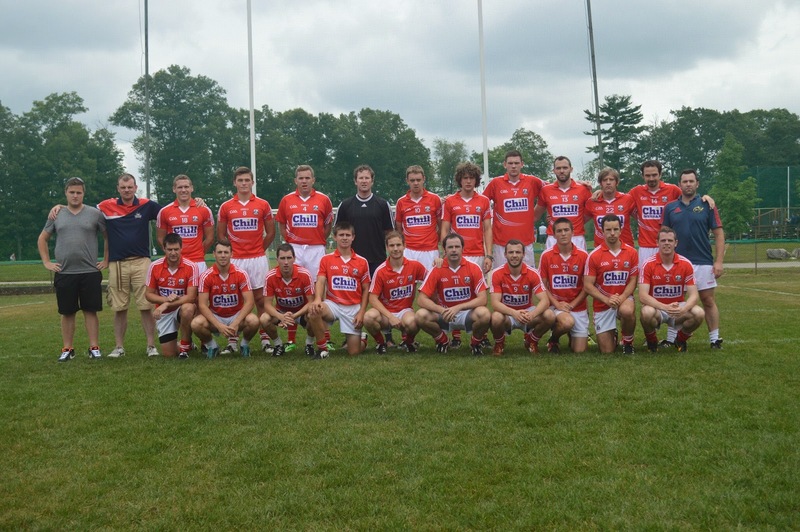 This year marks progress for Cork who are in the first junior final in a decade. The rebels came through a strong challenge last weekend from the Connemara Gaels, and did it without the services of three first choice players. The services of Eoin Barry, Mick Lyons, and Colm Caffrey will be at the disposal of management for the final. Cork lost out to Donegal in the final game of the regular season, a result that could have gone either way. Cork have shown themselves to come in and out of games. A consistent 60 minutes will be required to prevail on Sunday. A minutes silence was observed before the game in honor of Tommy Kineavey who passed away unexpectedly recently. Tommy was a great supporter of the GAA and was a frequent visitor to the games at the ICC. Charles McCarthy battled for possession. Wolfe Tones senior footballers are heading to the first championship final following an amazing win over arch rivals, Aidan McAnespies. The Tones trailed by nine points early in the second half and mounted a gutsy comeback to emerge one point winners in a tension filled finish that had the supporters of either side, and even the neutrals, gnawing at their fingernails. McAnespies went in at the break ahead by a goal. It came in the middle of the half with the Tones leading by three points. McAnespies opened up the Tones defence with a running attack, and Michael Quinn finished well from close range. The Tones had got off to a great start. Michael Argue, Mike O’Brien, and Darragh McVeety pointed four between them, to one from Caoleain O’Boyle. Argue was shown a black card for a challenge in the middle of the field after 15 minutes, the big Cavan man would represent a severe loss for the Tones. McAnespies enjoyed the advantage, and with Gareth O’Neill working hard to help out the defence, outscored the Tones four points to one in the latter stages of the half to lead on a 1-5 to 0-5 score. Glen O'Connell challenged by Niall Gallen. Two goals within the first five minutes of the restart catapulted McAnespies into a nine point lead. Peter Mallon netted the first and following some great work by Michael Quinn, Daniel McKinless the second. The signs were not good for Wolfe Tones. A goal was badly needed even with 25 minutes left on the clock to generate any hope. It was Dan McCabe, a latecomer to the panel, who did the honors. Fielding a high ball and shooting on the turn, the ball hit the back of the net, and it was game on again. Four points followed for the Tones as the side was urged on by their supporters. Glenn O’Connell, Farrell, McVeety and Lee Carr chipped away at the coal face and the gap was now just two points with plenty of time left. An O’Boyle free broke the Tones scoring streak. The sides now traded scores as play flowed up and down the field, and the one goal gap between the sides remained until time was down to 8 minutes left. Gareth O’Neill was sent to the line for a black card offence, and the Tones pulled within a point after scores from Charles McCarthy and Farrell entering the final stretch. A lengthy stoppage ensued following a serious injury to Wolfe Tones’ Sean Higgins, who suffered an ankle break following a tangle of legs. Following the 25 minute delay, Marty Farrell leveled the scores with a pointed free. Fellow Down native McCabe put the Tones one to the good with five minutes left soon afterwards. Tensions were high as the final minutes saw McAnespies level the scores through Quinn, the Tones go ahead again with a steady Farrell free, and Collie Donnelly almost score the game winning goal only for Cathal Hynes to get down and pull off a great game winning save. The ensuing 45 from Liam Boland drifted wide of the posts, and that marked the last action of the game. Scenes of delight on the Tones side of the field as a season in which the first senior playoff win will also mean a first senior final. A week and the Shannon Blues between the South Boston men and the North American Finals. Tones: C. Hynes, K. Clarke, S. Higgins, M. O’Brien, K. Cleere, G. Brilly, L. Flynn, M. Argue, D. McVeety, C. McCarthy, G. O’Connell, M. Farrell, L. Carr. Macs: P. Coakley, C. McPartland, M. Bogue, D. Wrynn, D. Lally, N. Gallen, C. Donnelly, C. O’Boyle, M. Quinn, P. Mallon, G. O’Neill, D. McKinless, L. Boland. Shannon Blues squeaked past Donegal in the first of two wonderfully exciting senior football semi finals. The Blues opened a six point lead early in the second half only to see it disappear with less than five minutes to go, and Donegal lead by two. The Blues dragged themselves back to level the scores, and Darren Wallace put the winner over the bar after coming on as a second half substitute. Sean O'Connor on the attack. The initiative changed hands twice during the opening period. The Blues came out of the blocks fast and held a four points to one lead. Donegal eventually signaled that they were coming to grips with the Blues pace, and made several chances that ended up wide. Eventually the ball began to go between the posts for the Donegal men. Griffin, Boyle, McLaughlin, and Murray all tallied points. Donegal were in front this period, beating their opponents to what seemed like every ball, and looked like they were taking over. The Blues rallied towards the end of the half and pulled ahead before the break as the game ebbed and flowed. Sean O’Connor, Darragh Treacy and Niall Murphy opened up gaps in the Donegal defence, and points came from each of the three. At the break it was a one point Blues lead, 0-8 to 0-7. Mark Canney tries to stop Niall Murphy. The Blues got the second half off to a great start with three unanswered points, a great restart. Denis McElligott made the gap six points with a great individual goal to slide the ball into the corner of the net under the challenge of two Donegal defenders. Donegal introduced Simon McDonagh to the fray and the big midfielder made a huge difference after coming on. The Blues attacks were limited as the big Donegalman won 5 kickouts in a row. A penalty was awarded after a Donegal move cut open the Blues defence and McLaughlin was pulled down in the box. Griffin put it away expertly and there was just two points in it coming into the final sequence of the game. Donegal continued to control the direction of traffic. Both scores that leveled the game came from McLaughlin; five minutes to go it was anybody’s game. The Blues shortened up the kickouts to hit the wing backs. Donegal took a one point lead, but in a rare Blues attack, Sean O’Connor, whose effort when the chips were down was tremendous for the Blues, was pulled down by Matt Smyth while bearing down on goal. Smyth was shown the black card, a loss to the Donegal’s midfield effort, and O’Connor leveled from the free. As the possibility of extra time approached the Blues had a last chance and Darren Wallace put the ball over the bar from 30 yards. Donegal had one last chance of their ownto draw level, but in a turn of events from last week’s quarter final game, Steven Griffin put the high pressure kick wide from a difficult angle. Blues delight as they advance to their second final in three years. Blues: C. Wallace, T. Wallace, G. Ryan, D. Clifford, J. Walsh, D. McElligott, A. O’Donovan, K. Byrnes, S. Moriarty, S. O’Connor, D. Treacy, P. O’Connor, N. Murphy. Donegal: E. McCarney, M. Canney, J. O’Connor, S. Doherty, G. Gallagher, C. Healy, M. Smyth, C. Thompson, G. Clancy, S. Griffin, D. McLaughlin, S. Boyle, R. Murray. Galway made their fifth senior hurling final on the trot by coming through a testing game against a Tipperary side that never gave up. Galway threatened to put the game out of sight in the first half, but Tipperary hung in and in the second half reduced the gap to two points. Galway however, rallied when they needed to and came through by three points thanks to some timely scores from John Moylan, Paul Holden, and James Regan. Splinters fly as Galway and Tipp clash. A stiff breeze favoured Galway in the first half and the tribesmen capitalized. There were several scores from distance. Regan in the middle of the field accounted for a handful of well taken points, Rory Hickey and Holden added to the tally. Galway had plenty of room to shoot from the middle areas of the field. Each time Tipperary managed a score, it was answered in kind by Galway as the Premier men could not put back to back points together. Corner back Niall O’Connor was shown the line with about 20 minutes gone to add to Tipperary’s difficulties. At the break Galway held a fairly comfortable looking six point lead, 0-13 to 0-7. Michael Harney controls as Greg Lally awaits. The second half saw Tipperary draw closer. A couple of early points, one of which could have been a goal from Kevin O’Brien, narrowed the gap. Galway got off the mark in the second period with a fine John Moylan point and another from Holden to steady the tribesmen’s ship. With the difference between the teams at seven points Tipp worked an opening beautifully for Michael Harney to hit the net. Two Paul Buggy frees made it a two point game as Tipp worked hard to turn the tables, with Cronan Dempsey covering a lot of ground to keep the rally going. Galway reawakened however. Moylan, Holden, and a fantastic effort from Regan made it a two score game. Tipp went looking for goals as time was a factor and eventually one came from the boot of substitute, Mark Kavanagh though the full time whistle beckoned. Galway had the final say with a Holden free and with that time was up. Galway through to the final to meet Tom’s in next Sunday’s final, and a chance at a Boston title and North American finals place. Galway: J. Skehill, P. Dowling, C. Murphy, S. Phelan, G. Lally, JJ Doyle, J. Regan, O. Floyd, P. Holden, R. Hickey, J. Moylan, T. O’Hanrahan, R. Cummins. Tipp: C. Hennessy, N. O’Connor, S. McGarr, S. Nally, P. Flaherty, J. Kindregan, C. Dempsey, R. Sludds, T. Devine, A. McRedmond, J. Kelleher, K. O’Brien, M. Harney. Cork and the Gaels played a very exciting 60 minutes of football. The teams were evenly matched and there was very little between the teams throughout. A goal in either half ended up delivering the goods for Cork who had the ability to stretch the Gaels defence that little bit more when going forward. The Gaels AJ Maguire looks for a way through the Cork defenders. It was an absorbing first 30 minutes with the game moving up and down the field nicely. The Gaels moved the ball well through Conor McNamara in midfield, and Emmet McConnell and AJ Maguire in the half forward line. The youth league product, Maguire, produced a very controlled performance, and accounted for a well taken point mid way though the half. Kevin Owens at corner forward pointed twice, as did Conor McNamara bursting though the middle, and Chris Devlin stole forward from corner back to tally a score. Cork’s scoring came in a spurt of a goal and two points. The goal came from a Jack Lynch pass to Cian Clifford and the tall corner forward finished well. Lar Barden and John Crowley pointed, while towards the end of the half it was a Mike Moynihan point followed by one from Jack Lynch that edged Cork into a lead heading into the break. With the game in the balance a second half Cork goal put the rebels in the driver’s seat. The Gaels had restored parity. Subsitute Kieran Cox proved effective in the Gaels forward line and Kevin Owens swung two lovely points over the bar. Emmett McConnell had put the equalizer over the bar just before Cork hit with the goal. James O’Donnell had saved the Gaels’ bacon on two occasions, but there was not much that the Leitir Mor man could do after Alan Keating stole between two Gael’s defenders to fetch a high ball, turn and finish well to the far corner. Moynihan followed up with a point to make it a four point difference. Owens reduced the tally to the goal, and try as they might the Gaels could not make the breakthrough to the Cork rearguard. A late Cork penalty came off the post, but time was not on the side of the Gaels to try to rally once more. Cork will be making an appearance in a final for the first time in 11 years. Gaels: J. O’Donnell, S. Murray, C. Devlin, C. Conroy, P. McNicholas, K. Walsh, B. Joyce, C. McNamara, C. Lee, E. McConnell, AJ Maguire, K. Lowe, K. Owens. Cork: K. Reid, M. Carolan, D. O'Donovan, D. Brogan, D. O’Regan, S. Leonard, N. O’Connor, J. Lynch, J. Crowley, M. Moynihan, L. Barden, C. Clifford, A. Keating. Donegal junior A team followed up the success of their B’s from the night before with a very comfortable win to advance to the final next week. A controlled and dominant performance saw the northerners to a nine point win, and another step in the race for the Boston championship and a place at the North American Finals in two weeks. Brian Kelly and Paddy McCusker battle for possession. Donegal went in the break with a comfortable six point lead. Having enjoyed the majority of possession and with the back line having dealt with most of the opponents forays forward, Donegal led from the get go. The first four scores came from Donegal boots. Darren Doherty, Ciaran McDevitt, and Pauric McLaughlin were the scorers. Steven Magill and Enda Hamill cut the lead in half with a point each, but from then on it was mostly Donegal. Christy McLaughlin at corner forward got going in the latter part of the opening period and added another three, while Aaron McKenna pointed for McAnespies before the break. Aaron McKenna sets up a McAnespies attack. McAnespies tried to rally after the restart, however, came away with nothing from their first two attacks. Donegal on the other hand netted from Christy McLaughlin to add to their cushion. The Malin man took a pass from Brian Kelly and his low shot from the edge of the small square billowed the net. McLaughlin followed with a point and the Donegal lead hit double digits. Aaron McKenna had moved to corner forward and gave his side some hope with a well taken goal after gathering a high ball. Donegal looked in little danger of relinquishing their lead however, and maintained control for the remainder of the game. Barry Smith getting black carded did not help matters for McAnespies and the reserves were called up from the bench. As a light rain fell the game reached its inevitable conclusion, and a second final for Donegal next week. The quest for the Boston championship titles continues this weekend at the ICC in Canton. Seven semi-finals will be decided, along with the bonus of a playoff for a place in the Ladies senior football final to see who will advance to finals, and have a chance to represent the division in the North American Finals. In senior football there are 2 semi-finals on tap. The first sees Shannon Blues and Donegal meet in a battle that has the potential to be a fiery encounter. Each team has reason for motivation. The last time the teams met Donegal gave the Blues a severe drubbing, something that the Blues will desperately want to make amends for after having had two weeks to digest the defeat. Donegal almost crashed out of the championship last week against Kerry. It took a last minute point to see them through to this stage. The key to the game will be how well the Blues can marshall the dynamic Donegal forward line containing Steven Griffin, Daniel McLaughlin, and Sean Boyle. With the ability to move the ball at lightning speed, Donegal can put up scores very quickly. The Blues have scoring threats in Sean O’Connor, Paul O’Connor, and David Clifford. It promises to be an exciting encounter. Wolfe Tones and Aidan McAnespies meet in the second of the senior football semi finals. The Tones, to many people’s surprise, knocked out reigning champions Connemara Gaels with room to spare last week. McAnespies present a different challenge. Corner forwards Daniel McKinless and Liam Boland will require a close eye. McAnespies will attack with speed and strength. At center back Declan Lally embodies both qualities and can quickly turn defence into attack. The Tones have made a habit of doing the same thing. Last week the forward line had the shooting boots on. Last year the Tones lost out because of some inaccurate shooting down the stretch, last week was quite the opposite with the forwards putting the critical scores over the bar in the last 10 minutes. It will be interesting to see if the Tones can make it back to back playoff wins, or if McAnespies can maintain the psychological edge over their opponents. Galway and Tipperary will meet to determine who will advance to challenge Fr. Tom Burkes’s for the senior hurling title. Both teams made a late run to make it to this stage. Starting with the reliable James Skehill Galway are sound at the back. The Half back line is anchored by Greg Lally at center back and the Gort native has proved his credentials in recent outings. Paul Holden and Rory Hickey in the half forward line are scoring threats, while John Moylan can produce the spark if needed. Sound keepers with inter-county credentials are a theme in this game. Tipp have Waterford’s Clinton Hennessy between the posts. Hennessy was a fixture between the posts for Tipp during his Boston days and is arguably the best keeper to have played in Boston before or since. Rory Sludds, Cronan Dempsey, Mark Kavanagh, and Jack Kelleher will need to be on their best form to pull out the win, and although Galway might have the edge on paper, Tipp have shown in recent games that they can produce the goods when needed. Boston Shamrocks and Connacht Ladies meet in a playoff to determine who advances to meet the unbeaten Tir na nOg. The teams split the spoils this season, and third game is required to separate the two. The Shamrocks have returned to relevance in the Ladies senior football championship. With some bite in a defence that contains the likes of Brittany McGuire, and threats going forward with Clodagh “Mango” McGovern, Shannon Kelly, Linda Cronin, and Leanne McCrystal, the Shamrocks have the tools to overcome the two time champions. A hallmark of Connacht Ladies championship teams has been the ability to open up defences like a hot knife through butter. This season we have seen flashes of that. Full forward Catriona Foley is a major threat, and is ably supported by her cohorts in a forward line that also contains Jane Ward, Aisling Kerr, and Catriona Smith. The teams are evenly matched and this one can go either way. Cork junior A team will be looking to advance to the final Sunday. On the junior football front there are back to back semi finals on tap. First up is Donegal and Aidan McAnespies. Donegal have been the front runners this year. With the likes of Hugh Devine, Mark Dunphy, Pauric McLaughlin, and Christy McLaughlin, Donegal have strength throughout the field. The same can be said of their opponents. McAnespies field a strong side. From Barry Smith at the back, Neil Donaghy in midfield, and Aaron McKenna at corner forward, this game is likely to be as close as they come. Connemara Gaels will meet Cork. The Gaels may not have been expecting to find themselves contending for a junior championship at the start of the season, though Cork will prove to be a tough opponent to overcome. Cork were unlucky to finish second in the standings. Cathal Moriarty at corner forward can turn it on and is ably supported by Jack Lynch, Mick Lyons, and Colm Caffrey further back the field. The Gaels can blow hot and cold. Big performances will be required from the Gaels, including key men Chris Devlin, Brian Joyce, Ciaran Lee, and Emmet McConnell, to pull off a surprise and make it to the final. Saturday sees the junior B semi finals between the hot side, Shannon Blues, taking on Hartford, while Cork will meet Donegal to see who advances to next weekend’s final. It was classic championship football as Kerry pushed Donegal all the way in a battle of third and sixth placed teams. After the first 20 minutes Donegal looked as though they would come through the game at a canter, but three second half goals from Kerry had them in a one point lead late in the game and an incredible upset looked likely. To their credit, Donegal maintained their composure to level the scores and then take advantage of a last minute free to emerge one point winners. Sean Boyle accounted for 2 Donegal goals. Donegal’s forward line looked rampant at times in the first half, and on occasion the northerners returned Kerry kick outs back to score. Steven Griffin tallied a goal after rounding the keeper, and a good handful of points, while his cohorts, Sean Boyle, Ryan Murray, and Daniel McLaughlin turned the Kerry back line inside out on occasion. Boyle accounted for a goal to start the game after turning his man and finishing to the far corner. Kerry had to be resourceful and tried to deploy their players as best they could. There were a few well taken scores for the kingdom. Joe Fitzpatrick, Robbie Croft, and Owen McGreevey tallied excellent points. Having spent much of the first half on the back foot and with the game looking like it could slip past them, Kerry ended the half brightly and were hanging on. The game could have been out of sight, but the Kingdom trailed by just the two goals at the break. Steven Griffin rounds Lee Stacey to goal for Donegal. Kerry kept it interesting in the second half. An Owen McGreavey goal with about five minutes gone brought Kerry within four points. The teams proceeded to swap points. Kerry were able to find openings in the Donegal rearguard, and on two occasions could have netted a second. Joe O’Shea’s shot was saved by Eamon McCarney and a second ended up over the bar from Graham Glenn. Kerry eventually leveled the game with 10 minutes to go. McGreavey created the overlap with a pacy run and Glenn was tripped in the box as he tried to round McCarney. Croft took the penalty and put it in the corner. The game came to a rousing climax as it could have gone either way in the final 10 minutes. There was notable anticipation around Canton after a second Croft goal. The Dubliner may have been a little selfish as the obvious choice was a handpass to Glenn, but Croft took matters into his own hands and finished into the corner to put Kerry a goal to the good. Donegal, however, swept upfield from the kickout and moving the ball at speed and in clinical fashion, leveled after Boyle palmed into the net to level the scores again. The teams remained tied after trading points with the 60 minutes played. The end came after a Kerry free was put wide from about 40 yards by Croft, and Griffin pointed from about 25 for Donegal with virtually the last kick of the game. Cruel disappointment for Kerry, and relief for Donegal to hold off a gallant Kerry challenge. Donegal: E. McCarney, M. Canney, J. O’Connor, S. Doherty, G. Gallagher, C. Healy, M. Smyth, C. Thompson, G. Clancy, S. Griffin, D. McLaughlin, R. Murray, S. Boyle. Kerry: L. Stacey, M. Godley, A. Fitzgerald, J. O’Shea, S. Briggs, C. Moriarty, D. Foley, M. Condron, O. McGreavey, I. Whelan, J. Fitzpatrick, G. Glenn, R. Croft.